Are you in middle of a heated promotional campaigning? Then fret not, with these customized 2x3.4 campaign business card magnets round corner – 25 MIL, you are sure to give thumbs down to your political rival. These magnets are cost effective, funny and value effective against all odds. You can stay assured that people are going to take you seriously because these magnets can justify your requirement to get noticed. These proudly made in USA magnet work great for long term campaigning and offer true benefits for investment. 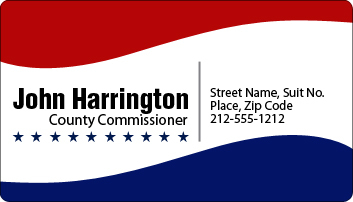 Request a quote to know value savings that you can expect to make on bulk orders of these promotional 2x3.5 campaign business card magnets round corner – 25 MIL.